I recently posted that three more whales have died this summer, making a loss of 7 whales since last November and bringing the population down to 83 animals. Obviously, this is disturbing news, but it was really bothering me for days. I finally figured out why. First of all, one of the whales that recently died is Blossom (J11), shown in the above photo with her daughter Tsuchi (J31) and son Mako (J39). This one seemed to hit me the hardest, and I realized that its because J-Pod whales have seemed "untouchable" to me. Since I started coming here eight summers ago, the only J-Pod whale that has died was the calf, J43, born last November, a whale I never even saw. 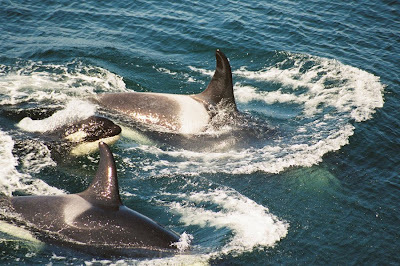 While there have been deaths in K and L Pods almost every year, the J-Pod whales are always reliably there. Even though we talk about the unfortunate and inevitable day when Ruffles (J1) and Granny (J2), the oldest male and female in the population respectively, will eventually pass - so far it hasn't happened. Additionally, these are the whales we see most often. This summer especially, K and L Pods were relatively scarce, so we get to the J-Pod whales the most and are most familiar with them. Secondly, when you lost 7 whales out of 80-some that's a big percentage. It was bothering me that more people weren't aware of it - that the public wasn't being told through any of the mainstream media. While talking to Jeanne about this, we realized that we could take an active part in solving this problem: tell the media. So, we wrote to several local news agencies, and low and behold - it appeared as a feature story in the San Juan Journal, and is now being covered on some popular local blogs as well. Maybe there's even more coverage to come. I hope as people find out about this sudden population decline, that they take is the warning sign it really is. These whales are probably dying because there isn't enough salmon - reports were that some of the late whales were notably malnourished before they went missing, and several other animals aren't looking good either. We don't have forever to get our act together to protect this endangered population. The first step towards getting people up-in-arms about protecting them is keeping them updated on the status of these threatened whales; then hopefully they will become involved in making sure we take action sooner rather than later. A very disturbing story. I hope you can get more national media coverage. I think about whooping cranes and how long it has taken biologists to help the population recover from 15 birds in 1940 and I know time is short. The good news is the US and Canada successfully partnered to bring whooping cranes back from the brink of extinction. Maybe these two countries can plow through the conflicts and set another international example with orcas. As always, this declining population is telling us something and we need to pay attention. I love the "Be Whale Wise" banner with safety details. Wish some savvy person would create one of these to raise awareness on the salmon issue so that bloggers all over the world could help spread the word. Vickie - at least its good to know there's still hope even after the population reaches small numbers. I've been enjoying your posts on the whooping cranes. I've been thinking of ways to get the salmon issue more in the public eye. I'll have to think about some snappy slogan or something that could accompany a web banner....that's a great idea. I know that you mean well, but the CWR's position is that the whales are officially missing -- we don't call them deceased until a year after they disappear, because there is always a chance that they might show up again (like the Luna situation). Even though with the low salmon runs and peanut heads, we have seen whales 'fill out' when food stocks improve. Also, since since the whales have been so spread out this year, it has been quite hard to document all of the whales. While it is safe to say that we know those particular whales are missing, there is always a chance -- however unlikely -- that they could be spotted again. Courtney, I do understand the official position of the Center, but honestly I think it's important to get that information out sooner rather than later, since chances are they have all passed away. Once they're "officially" deceased, we've lost another year in time to take action, and who knows how many more could be "missing" by then. I hope as much as the next person that the whales aren't really deceased and show up again, but it's important the public hears this information now. We need to take further action regarding these whales - as evidenced by the recent lawsuit but Canadian conservation organizations - and whatever information we have compelling people to take action needs to get out there. That's my two cents, anyway.